Treading quietly. 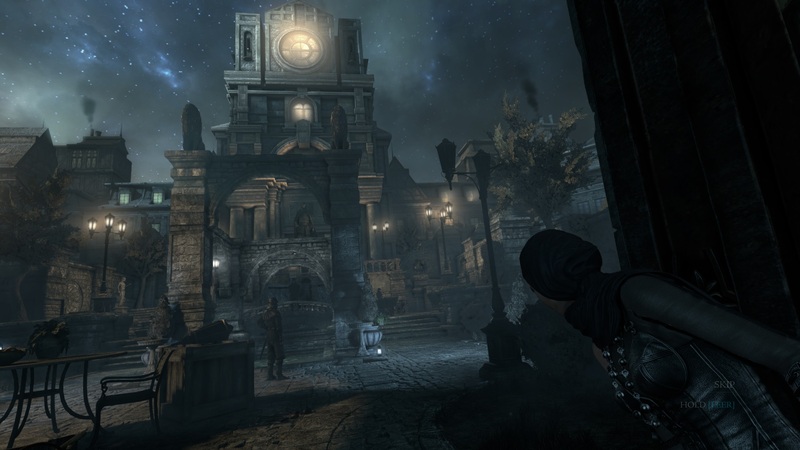 The underrepresented stealth-adventure genre gets a fresh wind with the new Thief game. This article will not cover whether the series-reboot attains to the quality of its predecessor. Instead, we will investigate how much performance the title demands of a variety of hardware components. Will owners of weaker notebooks be able to enjoy this game? 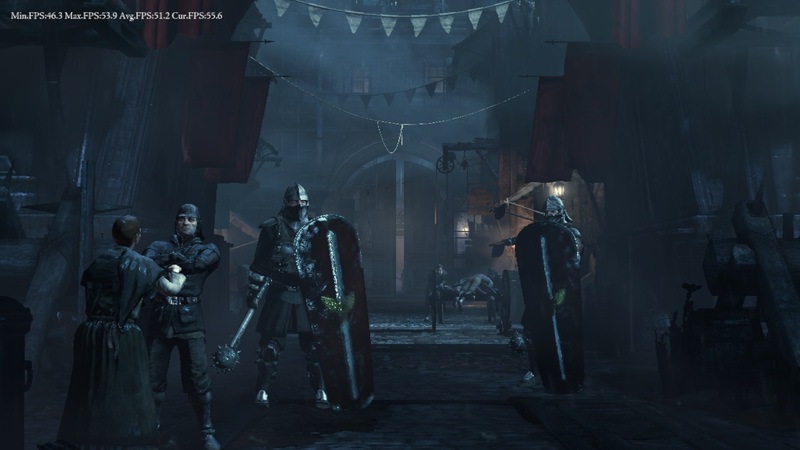 Like many new releases, Thief is based on a highly modified version of the Unreal Engine 3. Although the developers implemented a ton of new, hot features (parallax occlusion mapping, tessellation, etc. ), in some ways the graphics are lacking. While the lighting, shadows and many of the surface structures meet today's standards, other elements (faces, for example) seem a little outdated. Despite several weaknesses, however, overall the graphics quality falls somewhere between solid and good. Most stealth fans will be satisfied here. In terms of atmosphere, there is little to critique. With the exception of a few dreary passages, the game world fits together coherently. 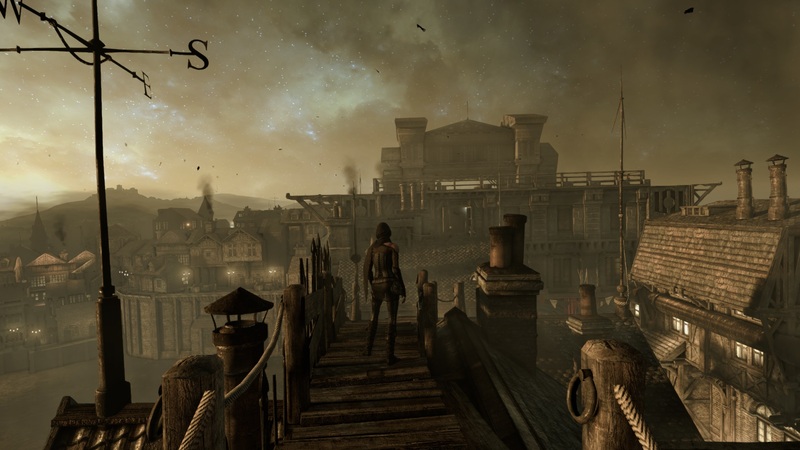 The aura is sometimes reminiscent of the 2012 release of Dishonored. Thanks to the protagonist's visible arms and legs, the player gets a thrilling sense of being "in" the game. We would like to give special recognition to Nixxes, who took care of the PC version of this game. The Dutch company has already drawn attention to themselves in the past for how well they port software across platforms (ex. Tomb Raider, Hitman: Absolution and Deus Ex: Human Revolution). 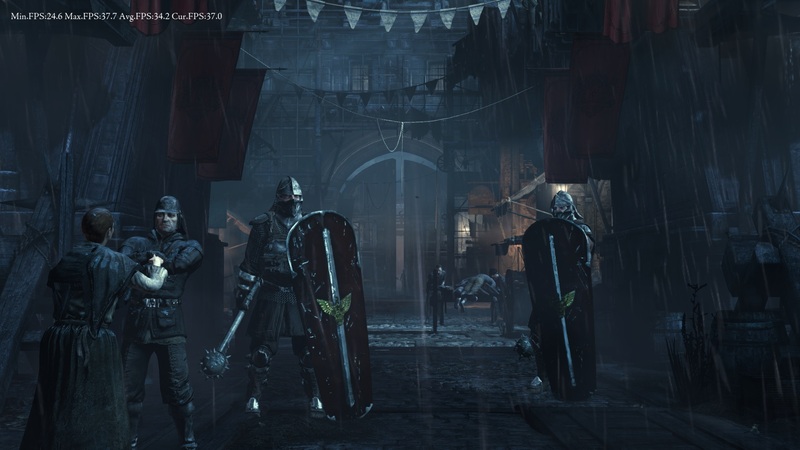 They are not known necessarily for their graphics conversion itself, but more for their commitment to promoting ease of use and implementing a wide range of settings options (much better than a console port). The user-friendly graphics menu, which is accessible even outside of the game, reveals a variety of options. Firstly, there is a "Display" tab with settings for resolution, picture mode, frame rate, vertical sychronization and the optional 3D mode. But there are even more options under the "Graphics" tab. Along with the FXAA anti-aliasing mode, Thief also supports the high-class SSAA. The five presets ("Very Low" to "Very High") prove to be very practical and allow the user to change the overall graphics quality quickly and easily. We used these presets in our tests. We also applaud the developers for the integrated benchmark as well. The sequence, which lasts about a minute, shows a city street lined with dozens of passers-by and sparkling with effects. Graphically, this sequence is quite demanding (see video). As far as we can tell from the time we spent in the game itself, inside the campaign the game generally runs more smoothly. Bearing that in mind, our benchmark result of about 25 fps suggests that the title runs at a reasonably playable speed. It is a shame, however, that the numbers do not quite remain constant. As we repeated the test, the results tended to vary by a few fps (especially the minimum fps). In contrast to other titles like Total War: Rome II, the visuals can only be scaled back to a limited extent. 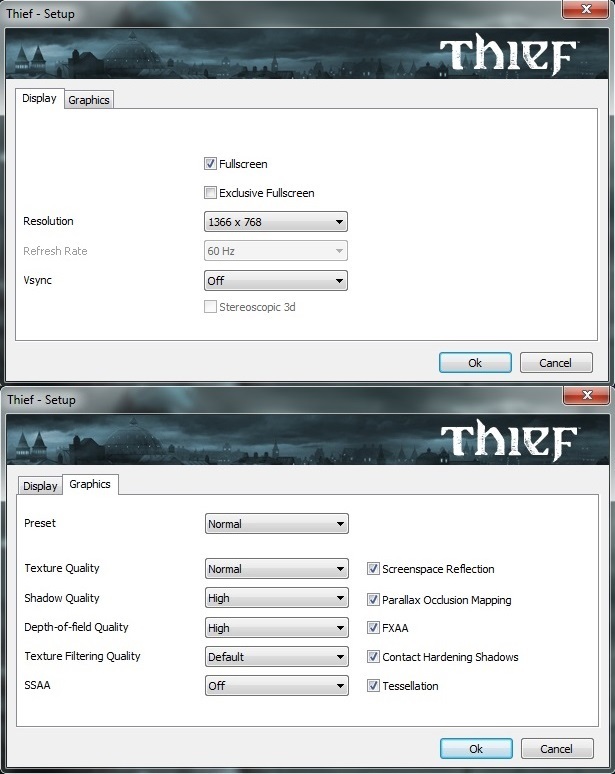 Pro: Even at low settings, Thief does not look ugly. Con: Because there are no giant improvements in performance when the graphics quality is reduced, weaker systems will quickly reach their limits. Independent of all this, the engine is well-developed. In our benchmark test, we only ran into one serious problem (an incorrect start with the Radeon R9 280X). When we ran the title on Intel GPUs, some textures were wrong, loaded too late or did not load at all, but it is possible that the problem had to do with the driver and not the game itself. From the perspective of a notebook user, the title's hardware demands are not exactly low. While mid-class GPUs, like the GeForce GT 740M, can still run the game fluidly on the "Very Low" preset (~30 fps), the popular HD Graphics 4000 and 4600 Intel chips only manage about 20 fps in the integrated benchmark. At that frame rate, the game is just barely playable, but it will not be much fun. For 1366 x 768 pixels and the "Normal" preset, you will need at least an upper middle class graphics card. The GeForce GT 750M is the first card to run the game at these settings with over 25 fps. If you want to play Thief at high settings, you will need nothing less than a bona fide high-end GPU. 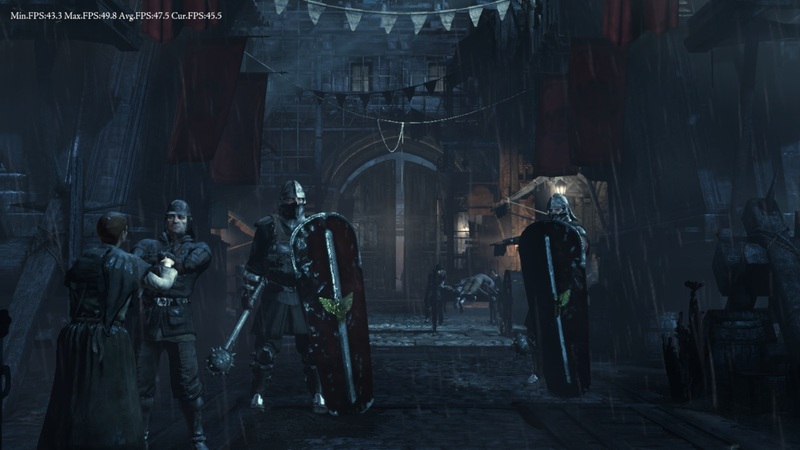 Even at a moderate resolution of 1366 x 768 pixels, the game will only run smoothly on a GeForce GTX 660M or higher. Only owners of expensive gaming notebooks will be able to enjoy the game's graphics in their full splendor. Only top models, like the GeForce GTX 770M or the Radeon HD 8970M, do well at 1920 x 1080 pixels and the "Very High" preset. 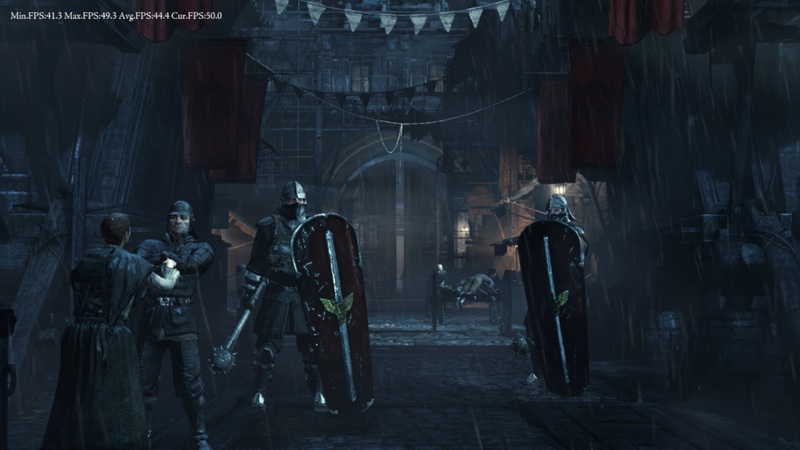 Because Thief is part of the Gaming Evolved program, it is not surprising that AMD graphics cards tend to achieve better results than their Nvidia counterparts. Need an example? The Radeon R9 280X desktop model comes in substantially ahead of the GeForce GTX 660 Ti in the "Ultra" setting, even though the Nvidia GPU almost never runs more slowly than the AMD card in other games. 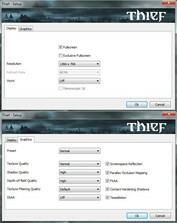 Additionally, strong GPUs prove that Thief can be limited by the processor. If you only look at the "Very Low" preset, there is hardly a difference between many of the high-end models (with identical CPUs). 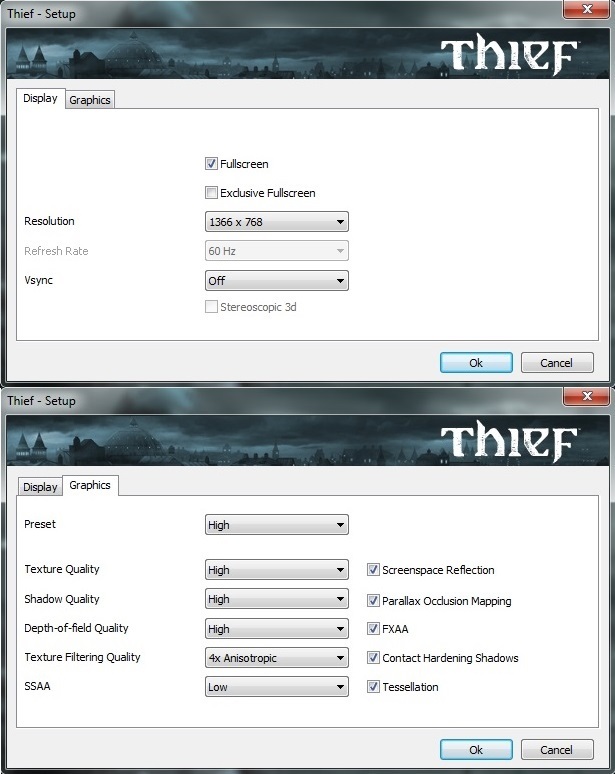 In the next few weeks, a patch should be released to give Thief support for AMD's Mantle technology. Future results will only be comparable to a limited extent. Note: As we unfortunately only noticed after we finished our benchmark tests, the game runs faster by a few percentage points when "Exclusive Fullscreen" is activated. The 64-bit edition of Windows 7 is installed on each of these notebooks. We thank Micron for the 480 GB Crucial M500. Benchmark results from changing notebooks (possibly with other drivers) to follow.